One Direction That Moment reminds us that we need to appreciate & enjoy the present moment. 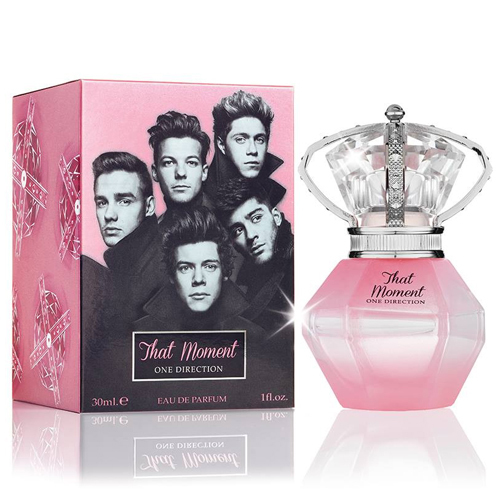 One Direction That Moment 100ml. Eau De Parfum is for women who love the commitment, style and distinctive fragrance and aromas. Floral and fruity connection with which you will feel irresistible and the center of all the attention. Discover the magic of intense essence that finds its way to your olfactory senses. One Direction That Moment's Parfum for women in their repertoire not miss fragrant jasmine, apple wood and musk. It is these ingredients take care of it, you'll enjoy any everyday moments. Offer the world with the aromatic scent nearby. Pink vial of scented water for women One Direction That Moment reflects a certain fragility, softness and sophistication. Royal fragrance named after musical groups with which you will achieve your. Essential maximum satisfaction, joy and endless smile on his face. Stylish fragrance That Moment by young British musical group is able to emphasize the individuality of the owner, give it charm . It is suitable for young ladies, brave, romantic and slightly daring. Pyramid was built on the notes of jasmine and pink grapefruit. Acute and fresh at the same time the heart, woven of violet and green apple, is set off by the basic sound of soft wood tones and gentle musk.